In case you haven’t already heard, we’re throwing a holiday party that’s going to put all your post-work, BYO-, ugly-sweater parties to shame. On Saturday, December 16 and Sunday, December 17, Thrillist’s Holiday Hideaway will take over the entire Industry City complex in Sunset Park, Brooklyn, for three days full of food, drinks, holiday movies, live music, and more. The best part? Every Industry City food vendor will be offering a Holiday Hideaway-exclusive off-menu dish, available for purchase leading up to the event, and as a free sample throughout the weekend itself. We’ve broken down every dish below, so you can plan your time accordingly (and make sure you manage to scoff all your favorites for free). 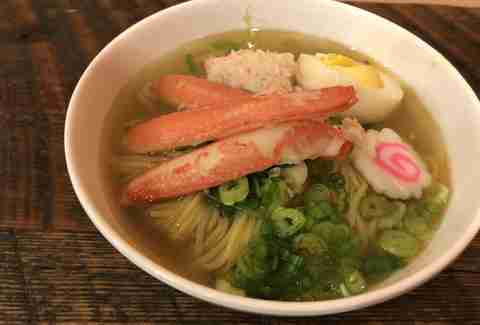 Ditch your bulky Canada Goose and warm up at IC’s resident ramen shop, which is serving a comforting crab leg seafood ramen, made with a shrimp and clam broth and topped with shredded crab meat. The caffeine masterminds behind the most expensive cup of coffee in the city are offering a fall-themed tea, infused with fresh herbs (and without the astronomical price tag). 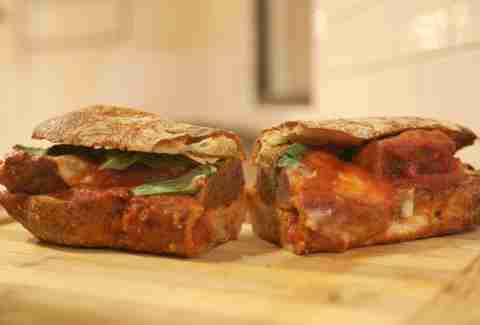 The popular whole-animal salumeria is offering a meatball sandwich made with 100% grass-fed beef slow-cooked in a thick San Marzano tomato sauce. It’s topped with aged provolone and basil, inside sourdough ciabatta. Hit up IC’s Korean comfort food spot for traditional dduk-bokki, a popular street food that’s essentially a stir-fried medley of rice cakes, carrots, onions, and fish cakes -- all glazed in a sweet and spicy sauce. 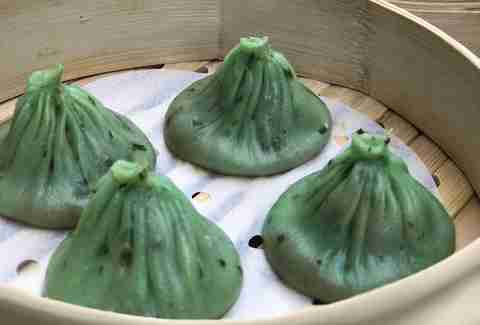 Typical dumplings get a holiday twist at this Shanghainese street food shop. Green ones are veggie; the reds are stuffed with spicy pork. Complement all that food with one of three seasonal bubble teas from Ninja Bubble Tea shop -- flavors include cinnamon vanilla cream, ginger lemongrass, and jalapeño black pepper spice. 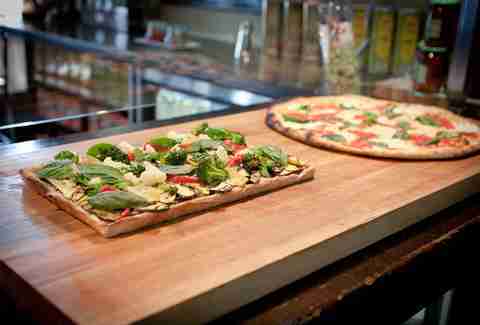 Stop by this coal-oven pizza joint for a 12-inch Harvest Pie topped with homemade butternut squash, spicy nduja, burrata, smoked pancetta, and a sprinkle of oven-roasted pumpkin seeds. Keep your energy levels up with a cockle-warming bowl of Bangkok BAR’s hearty Thai-spiced soup, featuring rolled noodles with crispy pork, boiled egg, and tofu. 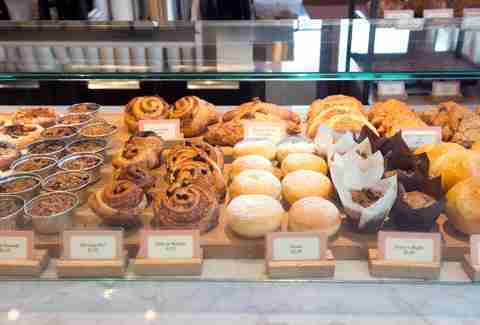 Because the holidays are about eating 10 times as much sugar than usual, allow yourself to indulge with this pastry shop’s special laminated brioche bun with apple compote, honey, and cranberries, plus a cranberry powder topping. Looking to feel a little bit better about all the holiday cookies you’ll be eating over the next month? Opt for Burger Joint’s veggie burger, made with crispy golden potato croquettes and a dash of tamarind sauce (served with French fries, because nobody’s perfect). Indulge your sweet tooth (yet again) with one of these chocolate hazelnut marzipan logs, hand-dipped in Li-Lac’s very own dark chocolate, and topped with a sprinkling of pistachios. 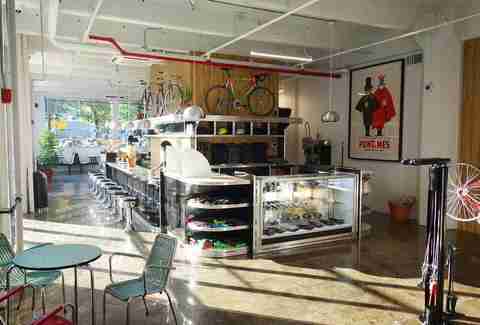 This boutique bike shop/Italian cafe is offering a fall-inspired roasted multigrain toast that will put your regular breakfast to shame -- it comes topped with farm-fresh Argyle goat cheese, crispy leek and garlic scapes, and roasted grape tomatoes. This is no ordinary Christmas cookie: it’s a fresh-baked chocolate delight, filled with tangy orange cream. You might think it’s not ice cream weather, but Brooklyn-born Blue Marble will definitely convince you otherwise. 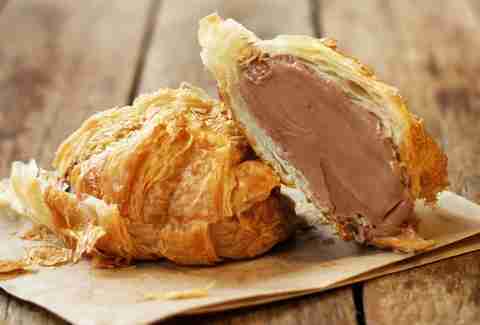 The IC outpost will be offering a blue ice cream croissant sandwich, laced with hot fudge sauce. IC’s cooking school is joining forces with One Girl Cookies for a Holiday Hideaway-exclusive baking demo, so you can spare your guests from the usual strangely burnt-on-the-outside and raw-on-the-inside cookies this holiday season. Attendees will learn to bake the signature chocolate thumbprint cookie, while sipping an orange hot chocolate spiked with Grand Marnier. 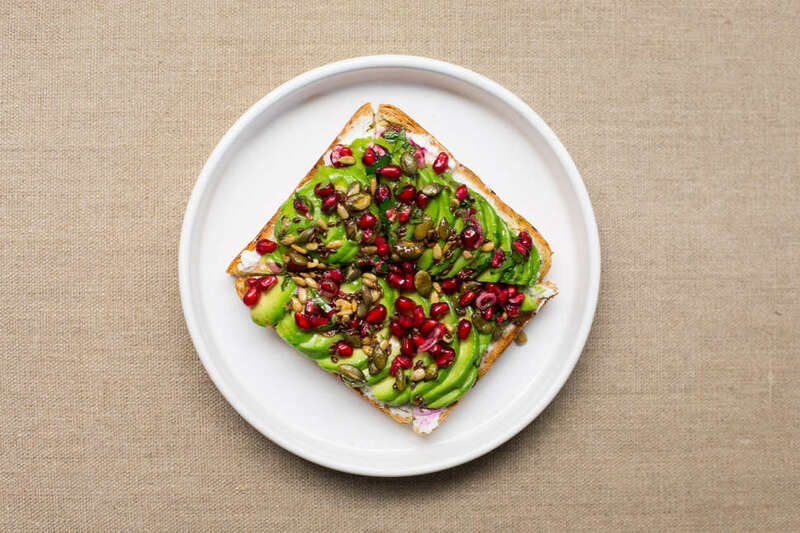 The all-avocado shop tailor-made for Brooklyn will be offering a twist on the standard avo toast -- the Pom Pom is a mash up of avocado with toasted seeds, pomegranate, and goat cheese on multigrain bread. 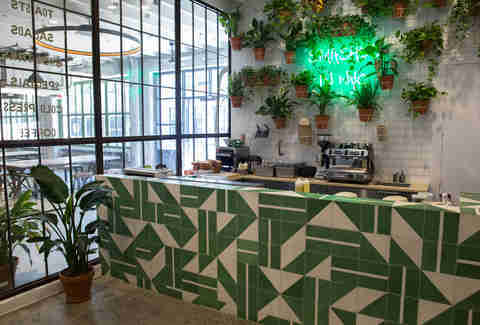 This Harlem-born spot is offering a special grasshopper taco topped with bean sprouts, refried beans, and a dash of creamy mango-and-pineapple habanero sauce. 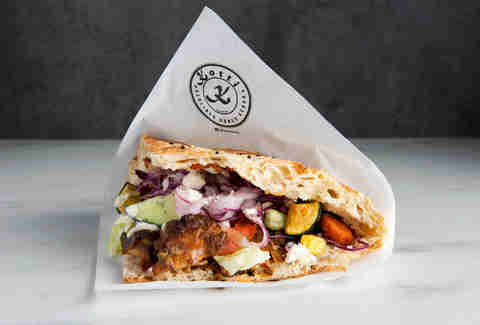 The first place to serve traditional Berliner doner kebabs in NYC is serving an exclusive seasonal version of its loaded sandwich: lightly toasted Turkish bread filled with marinated, rosemary-infused turkey and topped with vegetables, cheese, and white and red secret sauces. OK, so it’s not a free sample, but Moore Brothers can help you out in your search for last-minute gifts. There are two different gift-boxed bundles available at discounted prices ($25, $45) featuring two signature wines, detailed tasting notes, and suggested food pairings.